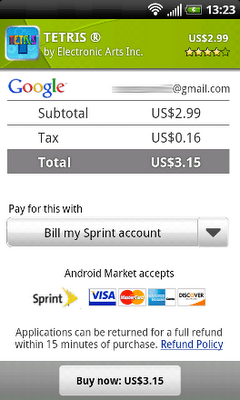 Sprint customers can now bill their Android Market purchases directly to their Sprint accounts. Following AT&T and T-Mobile, Sprint is now the third major U.S. carrier to allow this billing method. Android users can now simply press a button that says "Bill my Sprint sccount," and the charge will automatically show up on their monthly Sprint bill. Billing options have long been a problem for Android. In the beginning, there was Google checkout, but few people actually used it. Then the company was able to convince AT&T and T-Mobile to allow carrier billing. Still, the number of apps purchased on the Android Market is far outpaced by iPhone's App Store. Hopefully purchases will further increase when Verizon comes on board, which could happen later this year.